This cake is a beauty. It’s an oversized s’more in cake form. 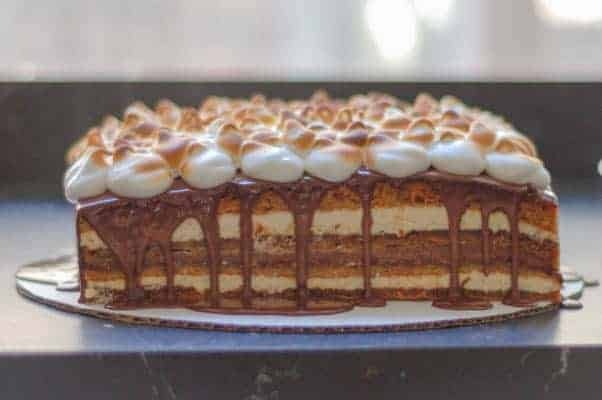 Four layers of honey graham cracker cake get filled with vanilla marshmallow cream and bittersweet chocolate ganache and topped with a gooey marshmallow meringue frosting which gets toasted with a kitchen blow torch to bring in a whiff of campfire. This cake was for my friend Kelly’s baby shower. Kelly’s a friend of mine from college, and in the camping trips we took together in our early 20s we toasted our share of marshmallows over campfires from downstate Illinois to South Dakota and made plenty of s’mores. She’s expecting a boy in June and I’m so happy for her. When our friend Liz asked me to make the cake for the shower, I thought of those camping trips and the exciting new adventures Kelly and Steve will have with this little guy. I had a clear picture in my mind’s eye of what this cake would be like, but I couldn’t find a recipe that exactly matched it. I found a version of the graham cracker cake in Regan Daley’s In the Sweet Kitchen but she calls for graham flour and I couldn’t find any locally and had run out of time to order it, so I swapped in ground up graham crackers for the graham flour. I wanted a rich vanilla marshmallow cream with enough body to stand up to multiple layers of cake. 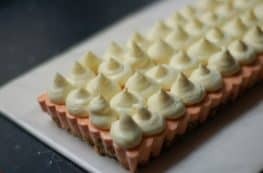 I was inspired by the white chocolate mousse that Joanne Chang uses in her triple chocolate mousse cake in Flour, Too. So I started with cream steeped with vanilla bean and poured it over chopped white chocolate to give it some stability. Then I toasted marshmallows under the broiler and stirred those into the cream and let it chill overnight. 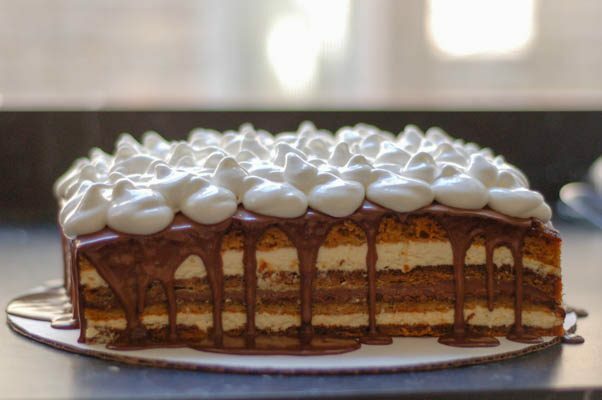 I knew I needed a deep dark bittersweet chocolate ganache layer to balance the sweetness of the honey graham cracker cake and the marshmallow cream. I remembered a nice sturdy one I had made a few years back for an opera cake from Joe Pastry, so I used that. And I knew I wanted to top it all with billowy puffs of toasted marshmallow meringue frosting, which I remembered seeing on a sweet potato cake on Smitten Kitchen. I like to think of this recipe as a team effort. 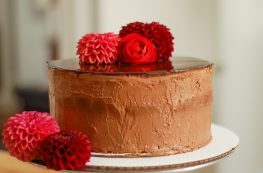 The sort of thing that I couldn’t have done without learning so much from other bakers much more talented than myself. It’s a big cake, but there was very little left at the end of the party. I’d say that’s a sign of success. Looking for more absurdly complicated cakes? 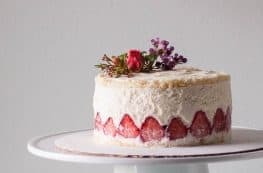 Try this triple chocolate mousse cake, this 13-layer chocolate mousse cake, this Momofuku-style Pink Elephant cake, this passion fruit lime bavarian, or this strawberry fraisier with Lillet chiffon cake. Looking for another excuse to use that blow torch? Try this cranberry curd tart. This cake is a project, but it’s totally worth it. The marshmallow cream should be started two days before you want to serve the cake. 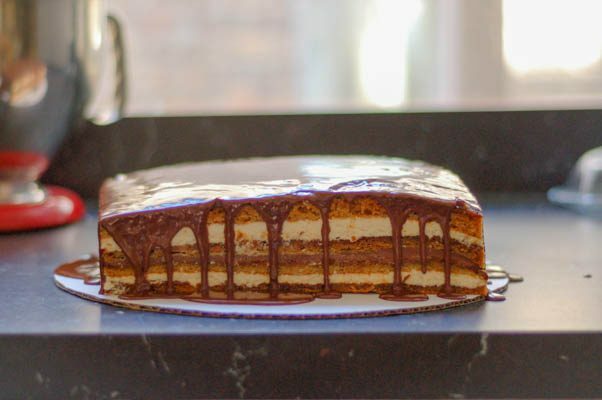 The cake and center layer of ganache should be made a day before you want to serve it. 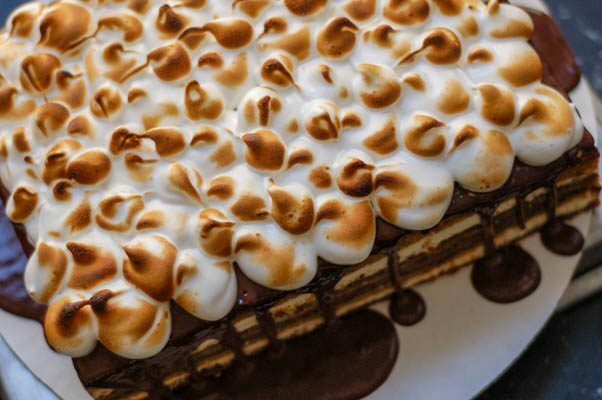 Then on the day you want to serve it, all you need to do is trim the cake, pour over the second layer of ganache, and top it with the marshmallow meringue frosting. Then you get to toast it with a blowtorch, and who doesn’t love that? Make the vanilla marshmallow cream. 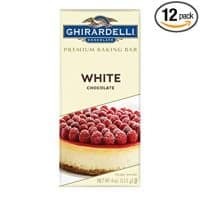 Place the chopped white chocolate in a medium heatproof bowl and have a strainer ready. Pour the heavy cream into a small saucepan. Split the vanilla bean in half and place it in the cream. Mash the vanilla bean around with a heatproof spatula to help release the seeds (you should see flecks of vanilla in the cream). Heat the cream just until it comes to a simmer, then remove from the heat and pour through a strainer over the white chocolate. Let it sit for a minute or so, and then stir together until the chocolate is completely melted. Preheat the broiler. 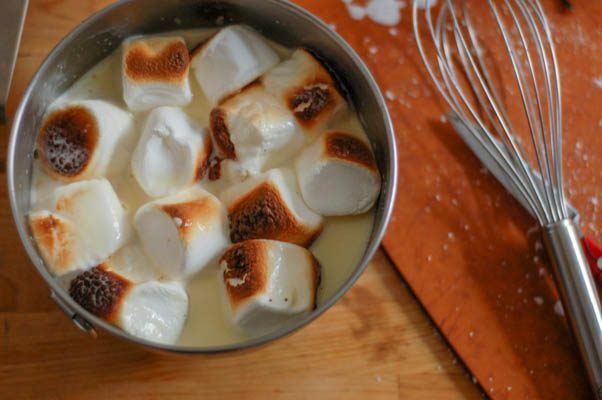 Place the marshmallows in a single layer on a foil lined sheet pan. Toast the marshmallows under the broiler until they are deeply browned on a few sides, but not burned, about 1-2 minutes (rotate the pan every 30 seconds or so). Add the toasted marshmallows to the white chocolate cream mixture and let them sit for a few minutes, then stir until they are mostly dissolved into the cream. Add the salt. Cover, and refrigerate overnight. Make the cake. Preheat the oven to 350°F. Line two half sheet pans with parchment paper and spray with nonstick spray. 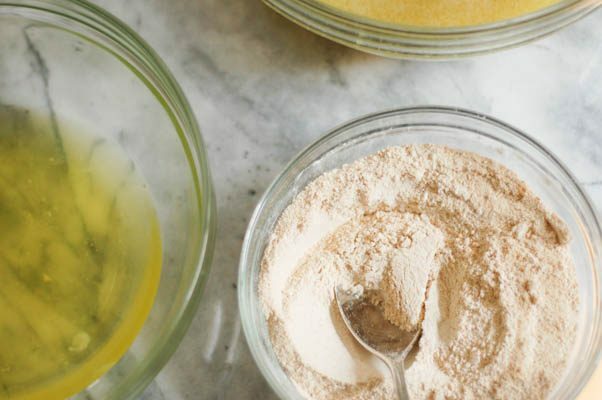 In a large bowl, whisk the egg yolks with 1 cup of sugar until combined. Add the honey, water, grapeseed oil, and melted butter and stir until combined. There’s a lot of fat here, so it may take a while to come together. Just keep stirring. 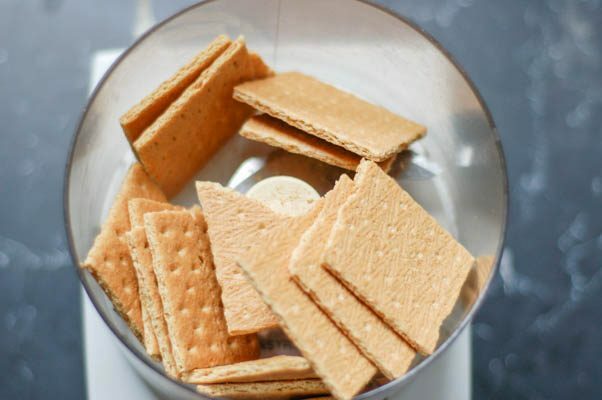 In a medium bowl, whisk together the ground graham crackers, flour, baking soda, baking powder and salt. 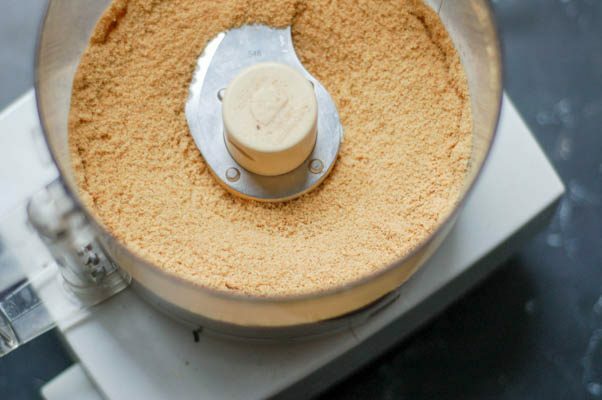 Gradually add the dry ingredients to the egg yolk mixture, stirring well between additions, until all of the dry ingredients are added and the batter is smooth. In the bowl of a stand mixer, add the egg whites and cream of tartar. Beat at medium-high speed until very soft peaks form. With the mixer running, gradually add in the remaining cup of sugar until the meringue is glossy and holds stiff peaks. Stir a big dollop of the meringue into the batter with a rubber spatula to lighten it, and then fold in the remaining meringue in three additions. Keep folding until no big streaks remain. Try not to deflate the batter too much while you’re folding. 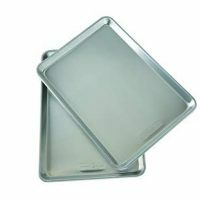 Divide the batter between the two sheet pans and spread with an offset spatula, making sure the batter is evenly distributed and reaches all the corners. 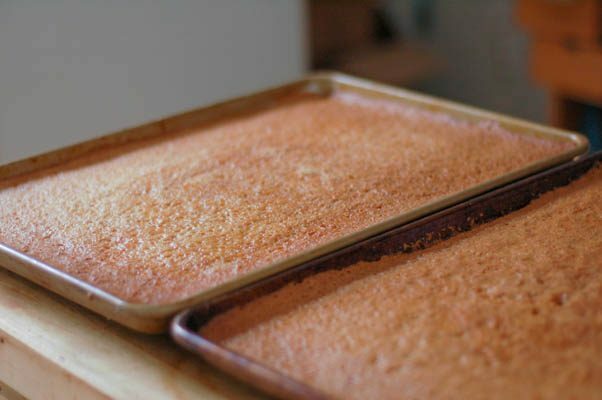 Bake the cakes, switching the sheets between oven racks and rotating them halfway through, about 15-20 minutes, or until the top of the cake is golden brown and the center of the cake springs back when lightly touched. Place the pans on wire racks and let cool. Make the soaking syrup. In a small saucepan, add the honey, sugar, cinnamon, and water. Heat over medium heat, stirring frequently, until the sugar is dissolved. Set aside to cool. Assemble the cake. Run a paring knife around the edge of each pan to release the cake from the sides of the pan. Using a very sharp knife (or kitchen shears) cut each cake in half–from the middle of one long side to the other–cutting through the parchment. You want to have four layers of cake, each about 8″x12″. Cut a piece of cardboard so it’s slightly larger than the cake. Take one cake layer with the parchment attached and carefully flip it over onto the cardboard and remove the parchment. Brush the top of the cake with about a quarter of the soaking syrup. 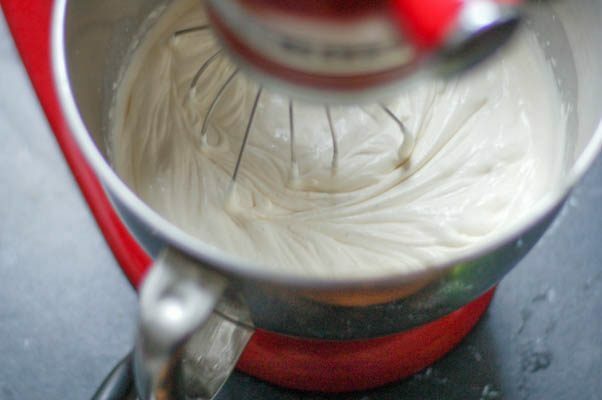 Add the cold vanilla marshmallow cream to the bowl of a stand mixer and whip until it holds stiff peaks. 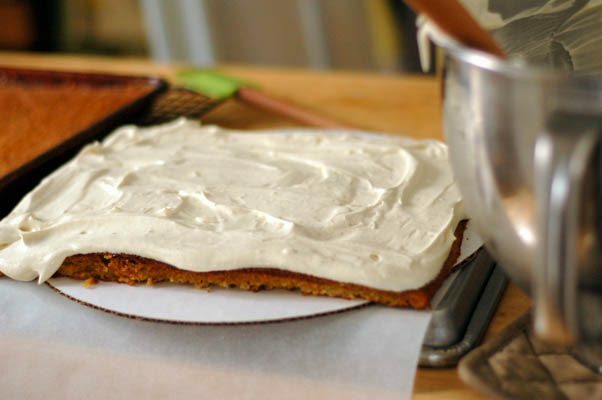 Using an offset spatula, spread about one half of the marshmallow cream over the cake in an even layer. Don’t worry if some drips over the edges–you’ll trim these later. Invert a second cake layer over the top of the cream, remove the parchment paper and brush the top of the cake with another quarter of the soaking syrup. Make the bittersweet ganache filling. 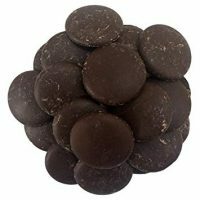 Add the 10 ounces of chopped bittersweet chocolate to a heatproof bowl. Partially melt the chocolate (either in a microwave in 15-second bursts or on the stove over a pan of barely simmer water). This gives the chocolate a head start and makes it easier to combine with the cream. In a small saucepan, add the heavy cream and bring just to a simmer. Remove from the heat, and pour directly over the chopped chocolate. 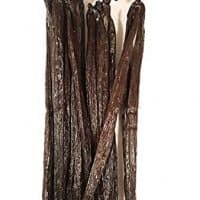 Let stand for a minute or two to let the chocolate continue to melt, then slowly stir, starting in the middle and working your way outwards, until the chocolate is completely melted and the mixture is smooth. Let stand for about 5 minutes to cool. Then spread over the second cake layer. Again, don’t worry if it drips over the sides. You don’t want it to mound too much in the middle. Spread it evenly. Invert the third cake layer over the ganache layer, remove the parchment paper, and brush with another quarter of the soaking syrup. Spread the remaining marshmallow cream over the cake layer. Invert the final cake layer over the top, remove the parchment paper, and brush with the remaining soaking syrup. Make sure there’s an even place in the freezer for the cake to sit overnight. Wrap the cake with plastic wrap and freeze overnight. Make the ganache topping. Place the chopped chocolate in a small heatproof bowl. Again, with this small amount of cream, it helps to partially melt the chocolate before you add the cream. You can heat it in 15 second bursts in the microwave or heat it over a pan of barely simmering water until it’s about half melted. Heat the cream in a small saucepan until bubble form around the edges. Pour over the chocolate and let sit for about 30 seconds. Starting in the center and working out to the edges of the bowl, slowly whisk the chocolate and cream together until the chocolate is fully melted and the mixture is uniform and smooth. 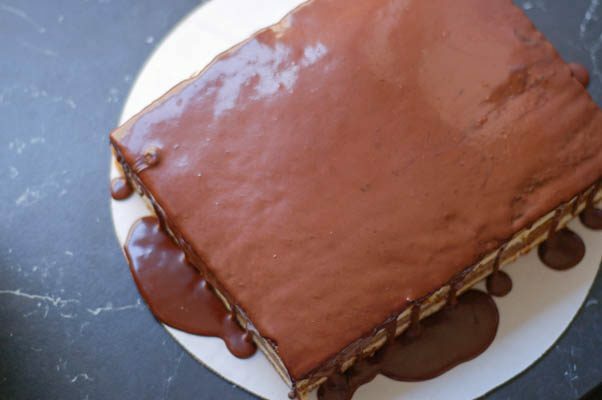 Immediately pour the warm ganache over the cake and quickly spread in an even layer with an offset spatula, letting the excess drip down the sides of the cake. Make the marshmallow meringue frosting. 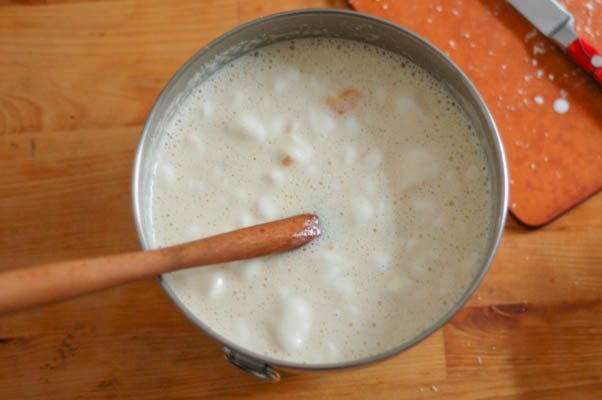 Place egg whites, sugar, and cream of tartar in a heatproof bowl over a pot of barely simmering water. Whisk constantly for about 3 minutes or until the mixture feels warm and the sugar is mostly dissolved. Transfer to a stand mixer, and beat on high speed until the frosting is smooth and glossy and holds stiff peaks, about 5-7 minutes. Transfer the frosting to a piping bag (or plastic zip top bag with a corner snipped) and pipe dollops of frosting all over the top of the cake. Using a kitchen blowtorch, toast the dollops until they are browned like campfire marshmallows. Wow does that ever look good! Thanks for the shout-out, Mary! Thanks Joe! I’m a big fan of your blog.